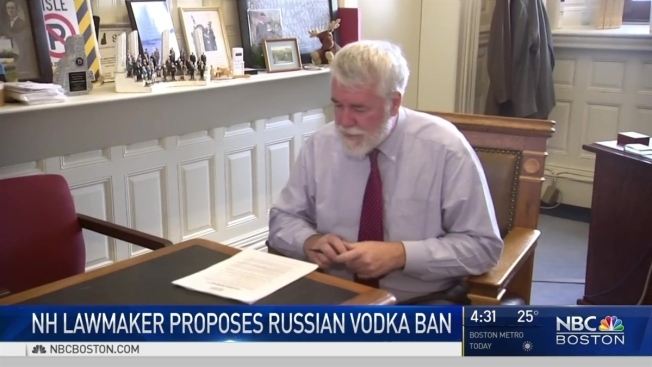 A New Hampshire lawmaker is proposing a state ban on Russian-made vodka as retaliation for Russia's alleged interference in our presidential election. The Democratic senator behind the proposal says the ban is an appropriate way to respond, but vodka lovers at the Hooksett Rest Area in New Hampshire say the proposal is just plain silly. "It's ridiculous," said Susan Maynard of Milford, Massachusetts. "I'll buy what I want." "I thought it was crazy. I think the senator is losing it," Baldasaro told NBC Boston Tuesday. Baldasaro calls the proposal "proof" that Democrats are sore losers. "They need to, like I said to the liberal media, get their heads out of their butts and focus on real issues facing our country," Baldasaro said. "There is nothing is more fundamental than the purity of our election process," Woodburn said. "One of the things that popped into my mind is Russian vodka," he said.